Pen-and-paper roleplaying games have been the backbone of western RPGs since forever. In the ‘90s, Interplay’s license from Wizards of the Coast fuelled a new wave of great D&D games. Maybe this’ll be the green light for the next. Obsidian have signed a deal to develop games based on tabletop RPG Pathfinder. The first game to emerge from the deal will be a tablet-only affair named the Pathfinder Adventure Card Game. That’ll have more in common with Hearthstone than Icewind Dale. But this is a “long term licensing partnership”, and we’d terribly surprised if licensees Piazo didn’t plan on taking advantage of Obsidian’s expertise with traditional RPGs at some stage. 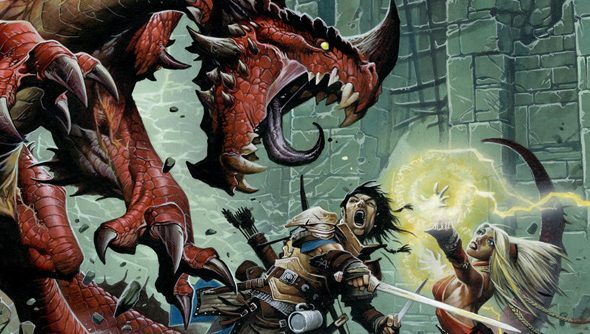 Pathfinder has evolved into an alterna-D&D in its five years of existence – spawning graphic novels, miniatures, plush toys, and an in-development MMO. It was originally based on D&D’s 3.5 edition. Will this deal do in lieu of a Neverwinter Nights 3? Or has Pillars of Eternity already fireballed that itch?